» How to embed watermarks in Office 2016 / 2019 Excel spreadsheets and PowerPoint presentations? How to embed watermarks in Office 2016 / 2019 Excel spreadsheets and PowerPoint presentations? Every quarter, our team creates handouts for management meetings. The process of developing the handouts is pretty elaborated and requires to collaborate in development a series of workbooks, presentations and documents. In order to clearly determine the status of those documents we wanted to use watermarks. Can you shed light about how to use watermarks, either textual (plain or smart texts) or graphical (pictures from our computers and the web). Thanks for the question. In this post you will learn how to insert or embed watermarks in Office 2016 applications like PowerPoint and Excel (you could potentially use similar techniques in Word and Visio). 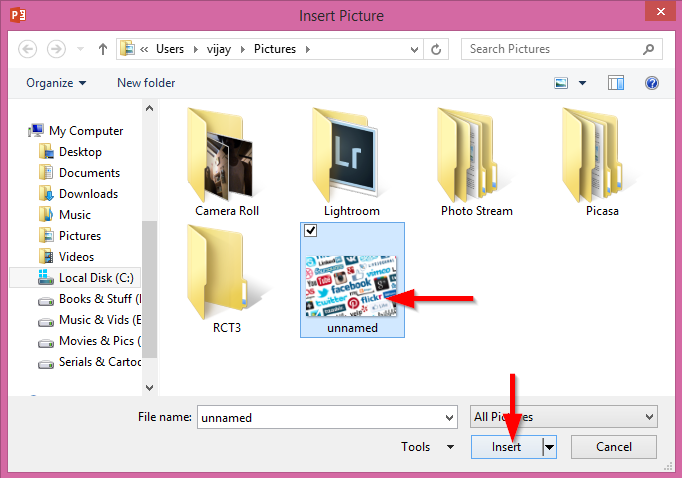 Note that you can use the same procedure in order to either add or remove a watermark. So without further ado, let’s learn how to use watermarks in Office applications. Go to View and select Slide Master. To add a picture watermark into your slide, click Insert and select Pictures. Browse to anyone of your desired pictures and click Insert. 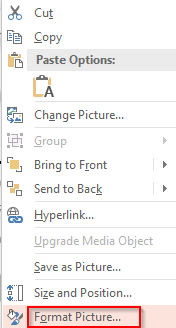 Now, in the ribbon select the Send backward drop down box and hit Send to back. Then right click on the picture and select Format picture. Select Picture in the box, click on Recolor and select a lightened picture. Go to Slide master and hit Close master view. 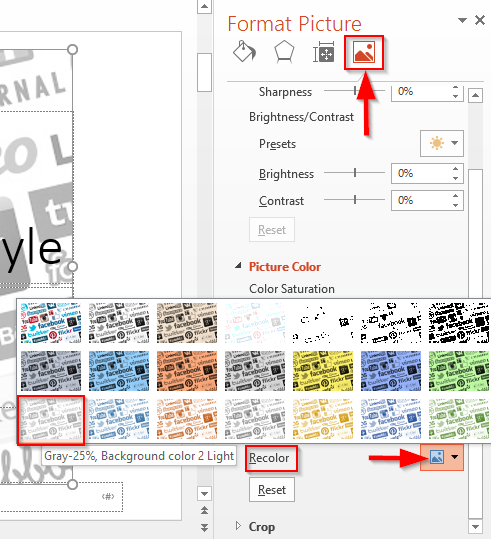 To insert a text watermark in your slide, click insert and select lightened WordArt. Enter the text that want to be your watermark. Now, right click on the text and select Format text effects. Then select text fill & outline and increase the transparency accordingly in the Text fill. The process of creating Excel watermarks is quite similar to the one we highlighted for PowerPoint below. To insert a text watermark in your slide, click Insert and select WordArt. Next, type the text that want to be your watermark (that would be “draft”, “in-process”, “copyright” and so forth). Next, right click on the text and select Format text effects. 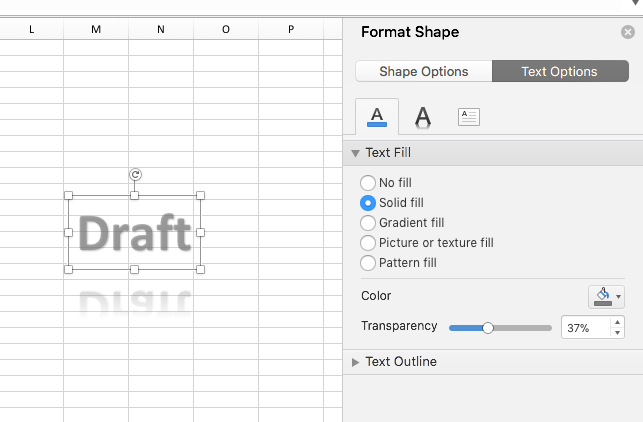 Then under text fill & outline and increase the transparency accordingly using the Text fill slider, as shown below (screenshot taken from Excel 2019 on MAC – looks similar in Windows). In Excel a picture watermark cannot be inserted, as the values are entered in the cell the picture transparency cannot bring the cells front to make it visible. 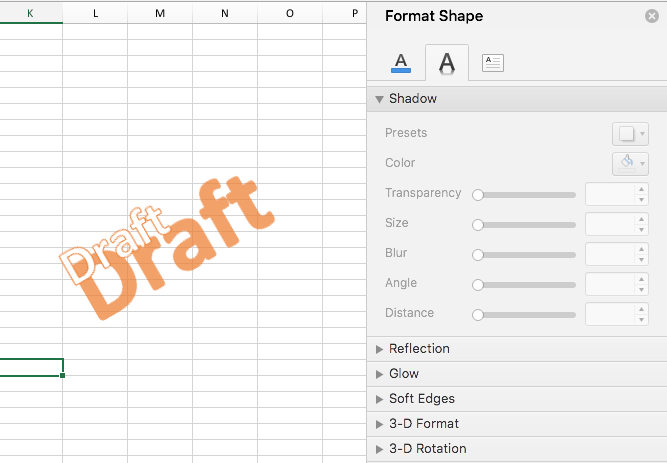 When adding text watermarks, you are able to set not only the transparency level, but also use the Text Format pane to determine the watermark color gradient, size, format, rotation and so forth. See below a different version of our Draft watermark, this time rotated, shadowed and different WordArt style. Got additional Office related questions? If so, then i would suggest to take a look into our guide on how to get your questions answered.